"It's not bragging, if you can back it up"
There is some truth to this, but the word "bragging" brings up thoughts of arrogance and no one likes to work with a cocky, arrogant, difficult person. No...that's not the type of bragging I'm talking about. If you're read my previous blog posts, you know I'm all about teamwork, collaboration, servitude, customer service, and the human aspect of leadership. We live in a very curious time. Social media allows us to put up a very convincing facade. We can brag about our fancy degrees, certifications, and accomplishments. Post up pictures of ourselves in highly interesting situations. We can make our lives seem so perfect that others envy us, which is exactly what some people want. Since this blog is titled "Unavailing Logic", lets apply some. Would anyone put something in a resume or on social media that wasn't bragging about their accomplishments or abilities? No one is going to put up, "I'm lazy and don't like to work". While that might be true for them, they aren't going to tell the world. No one knows more about the person looking back at you in the mirror than you. Yet we seem to place so much value on what others think of us. As if we need their validation to confirm the hard work and dedication we've put into our career. Our actions should speak for themselves, yet many, including myself, feed off of the praise of others. A pat on the back, an "atta boy", or any sincere praise from leadership is a huge motivator. Now, I'm not talking about the occasional goofy certificate you get for 5 years of service, or some corporate recognition program that systematically "rewards" as many people in the company as possible to "boost morale". And I'm certainly not talking about being patronized. No, I'm talking about true, heartfelt, sincere appreciation for you and the work you do, and the person you are. This type of recognition is very rare. Good leaders are in tune with their direct reports and learn what motivates them. They don't take a one size fits all approach to praise and recognition. They give each employee what they want and desire. Like I said...it's very rare when you have a true leader who understands the importance of employee moral, attitude, drive, desire, and accomplishment. An employee seen as a "bare minimum" performer may simply feel unheard, unused, unappreciated, passed over, and unchallenged. Basically, they're bored. Leaders need to make sure their employees are engaged and that not only their monetary needs are met, but their emotional ones as well. Perhaps I'll do a blog post on Emotional Intelligence in leadership, it's really important, but outside the scope of this post. 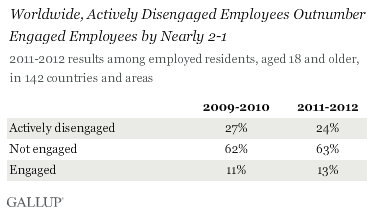 The above Gallup survey show only 13% of employees are fully engaged in their work. 13 people out of 100 are engaged. That overshadows the old "80/20" rule where 20% do 80% of the work. Apparently it's only 13%. So what about you? If your boss asks you, "are you engaged?". Of course, you're going to give a resounding "heck yeah! ", "I'm a team player", "I get things done", etc, etc, etc. But if you aren't engaged, that's more of the facade mentioned above. And frankly, if you work for a boss that has to ask, look for a new job. He or she is not a very good boss. While a good leader always asks for honest feedback, that's not what I'm talking about here. A good leader should have a PLAN to engage every employee. They should set aside time to talk with each of their direct reports and LISTEN to them. A leaders #1 job is providing their team with what they need to be successful. Any leader who is "too busy", "doesn't have time", "just got caught up in things", etc...is heading down a wrong road with their team. What they are really saying to you is, "I care more about my career than I can about yours". Some may see no problem with this, but if you find yourself as one of those disengaged employees, you know how awful it is to work in that state. How it breeds negativity. How complaining, dread, and even avoidance of work creep in, eventually harming your company and possibly your career. 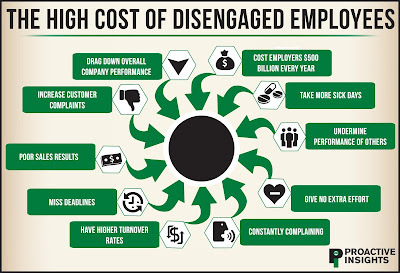 And if you are an employer who has leaders who allow employees to be disengaged, it's costing you a LOT of money. "I just come in and do my time"
"My boss doesn't listen to me, so I just keep my mouth shut and do what they tell me"
"I've taken sick days because I've hated my job so bad I was physically ill"
"I tell everyone new, just sit down, keep your mouth shut, and do what you're told and you'll have a job here forever. If you speak up, they'll run you out"
"They [leadership] don't care about people in this place. Just themselves"
"I just want to do my work and go home and not think about this place until the next day"
As someone who has spent the last 15 years of my career in a leadership role, studying leadership, and seeing first hand how important the human aspect of business is...these quotes are very frustrating and saddening. Have you been successful in other endeavors (service organizations, church leadership positions, etc.)? Were you happy in other jobs under different leadership? What skills and abilities make you marketable in the open job market? Get your positive mental attitude in order!! We can't control the circumstances, but we can control our attitude and our effort. Before you write your bad boss off, try to talk to them. If your boss gives you the old "you're going a good job" or "we need ya buddy" pattern answer, there is no reason to continue the discussion. EVERYONE can improve, and a good boss will always want to provide you with valuable feedback and an ACTION PLAN to help you achieve your career goals. It may be better to chat outside the office. 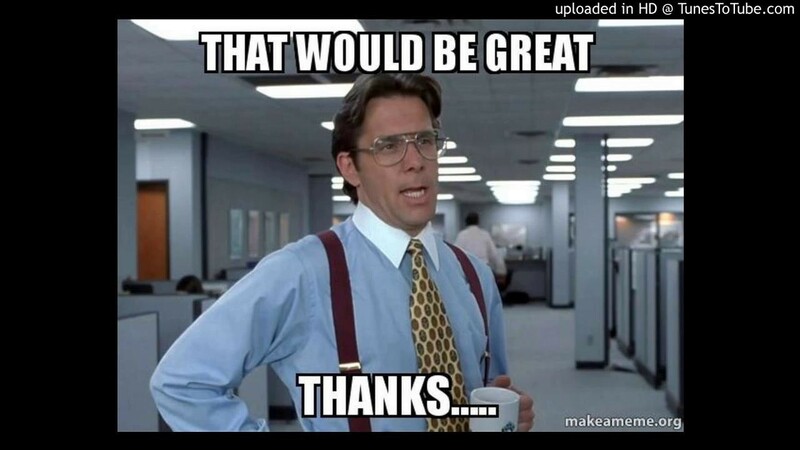 Go to lunch, have a cup of coffee before work, a beverage after work. As his direct report, you should be one of your bosses top priorities....even over his or her own boss. If you've done #2 and things didn't work out, then you are ready to move forward. You know your skills and abilities. Your wants and desires. Dream up your ideal job. What do you WANT to do? How do you want to be treated? People network! I can't emphasize this enough. The human side of business is the most important aspect. Regardless of what you do, you're really a salesman, and your product is YOURSELF. Always be selling! Seek out companies that have a reputation for being the type of place you see yourself. Don't just apply blindly for jobs! Don't settle. Jumping from the frying pan to the fire does you no good. Try to find contacts who work there. Get to know them. Let the leadership team know you are seeking them out and want to be part of their success. Make a talk track about yourself. Always be ready for an "interview". If you want to work for a servant leader, someone who has empathy for his team and wants them to succeed, you too must have a servant heart. Servant leaders are servants in their private life too. To find them, you have to meet them where they see you as an equal. Serve along side them. Show them your work ethic. Being involved in your community and helping others will repay you more than you can imagine. Maybe not in money, but trust me, your cup will be full. Get demoted? Passed over for a promotion? Didn't get that internal job you applied for and they guy they hired had half your skill and experience? As silly as it sounds, work harder at that job you're so disengaged in. If you're written off your employer and are planning on leaving the last thing you want to do is make them grateful you left. Show them how good you are. Leave on a high note. Always make sure you are "eligible for rehire" even if you never plan on working there again. Most leaders are promoted because they were good workers, but no one ever taught them how to be good leaders. This doesn't make them bad people. As much as you want to rant on why you're leaving, don't. Even in an "exit interview", keep your comments brief and generic. Stay positive! The old "if you can't say anything nice, don't say anything" applies here. Your former co-workers are still working there. Don't bring them down with negative comments or gleeful celebration about your departure. You're leaving for a better opportunity, not because the "company treated me bad". No one likes a victim. As of this writing, unemployment is at a record low. The economy is expanding and employers are looking for great people. Enjoy the free market! 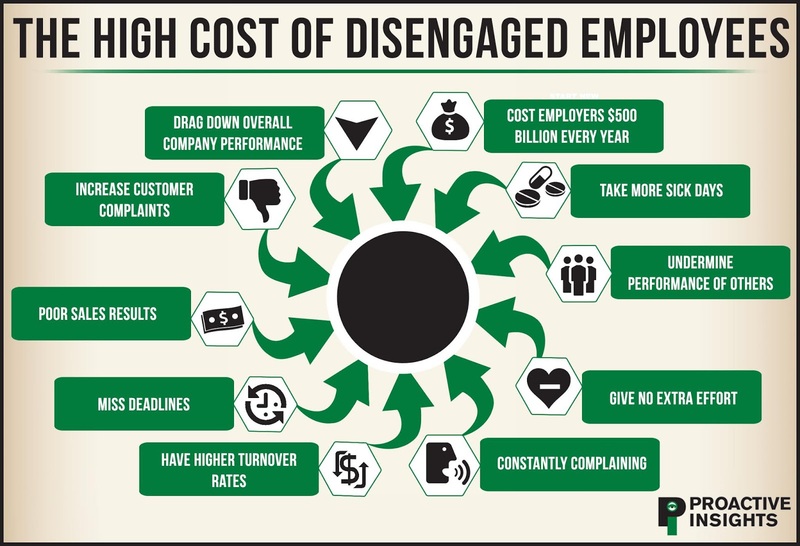 Don't stay at a job where you aren't engage. Don't work where you feel unappreciated, unimportant, or under utilized. Don't continue to be a part of the problem plaguing much of the workplace. You're better than that! Don't be intimidated by all the social media ninjas out there. They aren't as good as they seem. If you've worked hard, earned your skills, and get a thrill out of success, you're just as good as any social media salad someone posts up. Those who do great things don't do so by standing in line with everyone else. Be different. Stand out. Get positive and get moving. Your life is yours and what you make it. Make it great! I've worked as an IT professional since 1987. I was 15 years old when I received my first paycheck for technology work. My goal was always to continue running the family business my father had started. My brother worked in the company as well. It was what was expected, but not what I wanted. Technology was my passion. I'd had a computer in my bedroom since 1982. I learned to build peripherals from schematics as a 12yo. After I graduated college, I went into the family business to do what was expected of me. Through a very unfortunate turn of events, my father passed away in 1995 and the company fell on hardship. My brother was running things, and he had a conversation with me that I never thought I'd hear. "We can't afford to pay you bud". I'll never forget those words. The career I'd prepared for since I started to walk and talk, the family business, my Dad's company...was letting me go. How does this happen? 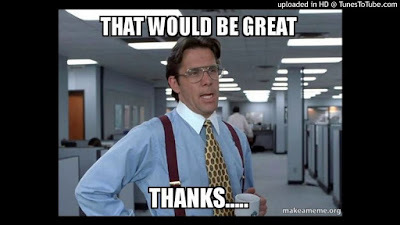 Where would I work? What would I do? I turned to the only thing I knew I'd succeed at. Information Technology. I was fairly advanced given I'd spent 14 years of my life working in IT as both a passionate hobby and professionally. But my resume was ripe with marketing, sales, and insurance industry experience. Who would hire me? Perhaps a failing company headed for bankruptcy. So, I applied at Service Merchandise Corporation for an entry level desktop analyst job. It was my first experience in a large IT enterprise. I was able to perform my prescribed duties, and when I had time, I'd volunteer to work with the more advanced roles in the company. Servers, networks, telephony, satellite communications, automation systems, program logic controllers, etc. I absorbed it all. I never had any fear of jumping into a project and I was rewarded for it. I progressed up the ranks quickly and worked at SMC until they liquidated just after the 9/11 attack. Now well into my career, with over 30 years of IT experience under my belt across many verticals, I've come to understand that my passion is learning about a problem, simplifying the complex, and delivering a comprehensive solution using technology. It allows me to use my love of people and relationship building, my logical processing ability, and my technology background. I also enjoy being a lifetime learner. Always thirsty for more knowledge. 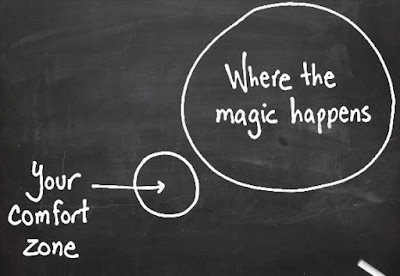 I've identified my abilities and what drives me, but what about that comfort zone thing? How does that work? How does it relate to you and why you're reading this blog? If you're the type of person who hates going to work, only does so to pay the bills, hates Monday's, and you see your work as something you have to do versus something you have the honor and privilege of doing, then you won't get much benefit from the rest of this post. If you stay at your job because the company is stable, the benefits are good, and the pay is okay, then you may not get much else from this post. If you want to be successful, you need to find a company who is willing to fully utilize your talents and abilities while helping you develop further. But where do you find these companies? There are several sites that list great places to work, but they assume that everyone is looking for the same thing. You need to do some research, people networking, and take an interest in a company. Find an employer who sees you as a valued member of the team. Everyone pulling toward the same goal. Take that leap of faith to move from the mundane to the exceptional. If you worked hard to be one of the best of the best, then set your sights on working for the best. I turned 47 this year. I've had career goals since I was in my 20's. Over the years my goals have changed from the position I want to reach and how big a house I wanted to have, to the level of excellence I want to provide for my company and customer. Job title is no longer my driver. I want to do great work, in a customer focused environment, where excellence is then norm. Good enough is not good. I want to walk out of the office every day feeling as if I've accomplished something great that day. 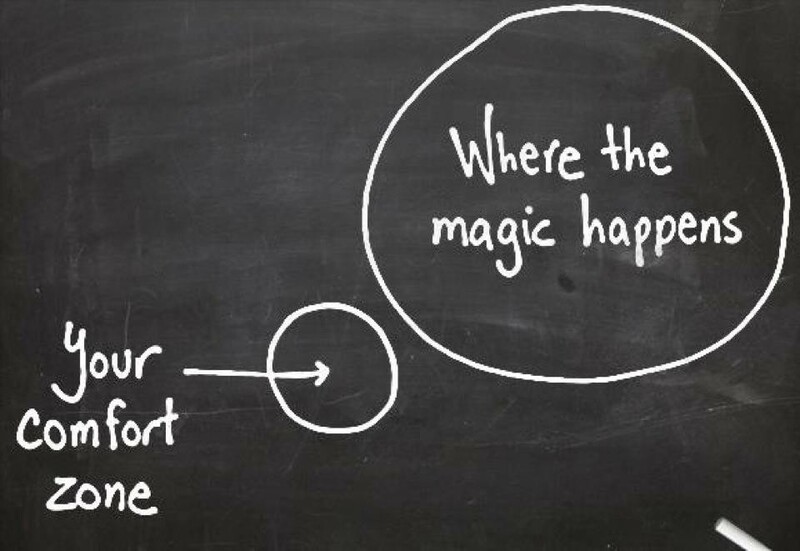 To do that, you have to leave your comfort zone. You have to push yourself to do things others think are crazy. There are no shortcuts in life. Life begins outside your comfort zone. Are you fully invested in your company? No, this is not a post about money or retirement. It's a post about your life. Are you fully invested in your work? As I write this, it's Friday afternoon. I can't count the number of times I've overheard people rejoice about it being Friday. Why? One would assume it's because they don't enjoy their work or their co-workers. I can understand, I've been in that situation before. It's a horrible existence to show up, punch the clock, and do your time. That sounds more like prison than a career. I had lunch with someone today that asked me, "What is your ideal job"? I had to put some thought into it. I didn't just think about the money, but about what the mission of the company is and how they treat their employees. I've worked in several places, and the best places to work were the places that fully utilized their staff's skills regardless of their job title. It was a true team environment where everyone helped each other and moved toward a common goal. In other words, they were fully invested in the company. They cared about each other and accomplishing the business objectives set forth by the executive leadership. They held each other accountable. Yes, the goal of any company is to make a profit, but the day you stop worrying about the money is the day you don't have to worry about money anymore. Be prudent with your financial resources, but work hard to be the best at what you do and build strong relationships with your customers. People enjoy doing business with people they like. A leader is someone who wants to make their employees successful. I've worked for some fantastic bosses over the years, and a few who taught me what NOT to do. A good manager focuses their team on objectives laid forth by executive leadership and uses the skills and experience of the team to come up with ways to meet those objectives. People want to do good work, but they have to have motivation to do so. A good manager is a motivator, a teacher, a mentor, and above all, a caring individual. Someone you can depend on. Communication is the key. Always let every person in the organization know why things are being done. Even if they don't agree, always attempt to get buy in from them. Ask them if you can count on their support. Everyone likes to be included and seen as someone important no matter what their role is. Dr. Edwards Deming was quoted as saying, "The emphasis should be on why we do a job". 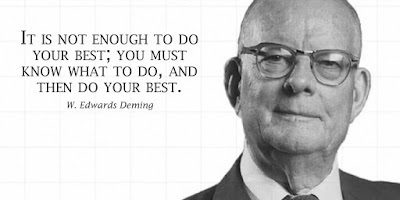 Those who aren't familiar with Dr. Deming's work should Google him. I had the pleasure of heading up the local philanthropic team of a company I worked for. Not only is it excellent PR for a company to work in the community to improve it, it's also very fulling for the employees. I always received a great deal of satisfaction working with my team to achieve a charitable goal. It builds strong teams when employees can see how much company leadership cares for others. People are capable of doing amazing things. I am still amazed at someone who can run an Ironman triathlon. That seems impossible, yet people do it. Many employers hire someone for a position, and fail to take advantage of the many talents and abilities they may have outside of their prescribed duties. Each of us have talents and abilities that can benefit our company above and beyond our position. Being fully invested in your company and willing to use those abilities to make it better is a big part of what makes a great job. 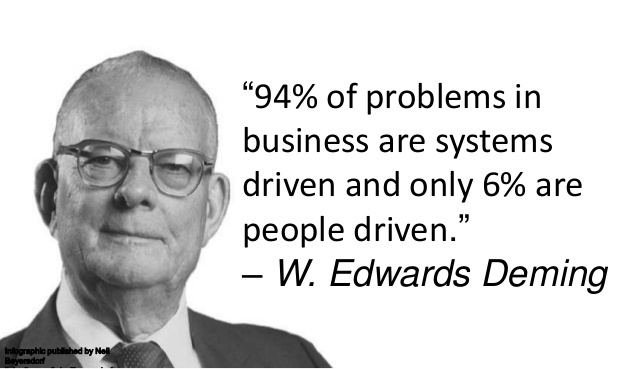 A business exists to meet the reasonable needs and expectations of its customers. In turn for meeting those needs, the business profits. Pretty simple, right? Not really. If a business is only focused on meeting needs they can solve, they are missing opportunities to help their customer. A good company also seeks to do what's best for their client, even if that means referring them to another company that can better meet their needs. Remember the scene in the Christmas classic "Miracle on 34th Street" when Santa was sending shoppers to other stores? Good companies are always looking for a better way. Continuously improving the way they do things. Not only does this help them maintain a competitive advantage, but it keeps things from becoming dull and fosters an atmosphere of innovation. Plan, Do, Check, Act (PDCA) in a continuous cycle. Always be improving. This is but a short list of things that make great companies great. I could expand on it, but in the interest of time I will leave it here. If you are a manager, director, executive, or business owner...take the time to get to know your team as people, not as job roles. Becoming fully invested in them will allow them to become fully invested in their work. Instead of "is it Friday yet", you'll be hearing, "wow...Friday already...this week has flown by". The end of another calendar year is upon us. Social media feeds are filling up with "year in review" posts. People look forward to a new year, a new start, a fresh beginning. Many make resolutions and have hopes for a better year than the one they just had. 2014 has been quite an experience for me. It started off really well. I'd just completed one year at a new job. The goals and objectives I'd set for myself and my team were making good progress. I was working in a role that was both rewarding and challenging. My career goal of becoming a Chief Information Officer (CIO) was within reach and times were good as far as I was concerned. I'd relocated to Alabama to have the opportunity of achieving my career goal and had met new friends and was adjusting to life in my new home. In March, a member of my team lost her husband. While attending the visitation, I had an opportunity to meet her two sons. They were very polite young men, and the emotion of losing my father hit me as I thought about her sons having to grow into manhood without their father to guide them. Perhaps this event was preparing me for what happened next. Three days later I was relieved of my duties as Vice President of Information Technology and found myself in an area with a sputtering job market. I had no equity in my home due to my recent relocation and was still saddled with costs associated with my move to Alabama. I kept the faith that something would come up soon. I prayed every day. I asked God to grant me patience and to give me peace in knowing that he would provide for me. With no income, times began to get tight. Anything I wasn't related to was getting sold. Desperation was setting in. Just when I was about to lose hope, I received a very attractive job offer to work in Huntsville for a military contractor. It would mean as much as three hours commuting to work and back each day, but it was a small price to pay considering the job. Sadly, due to some political red tape, I never received a start date for that job. It also cost me a month in my job search. But there is always a lesson to learn in life, and I was about to get one. 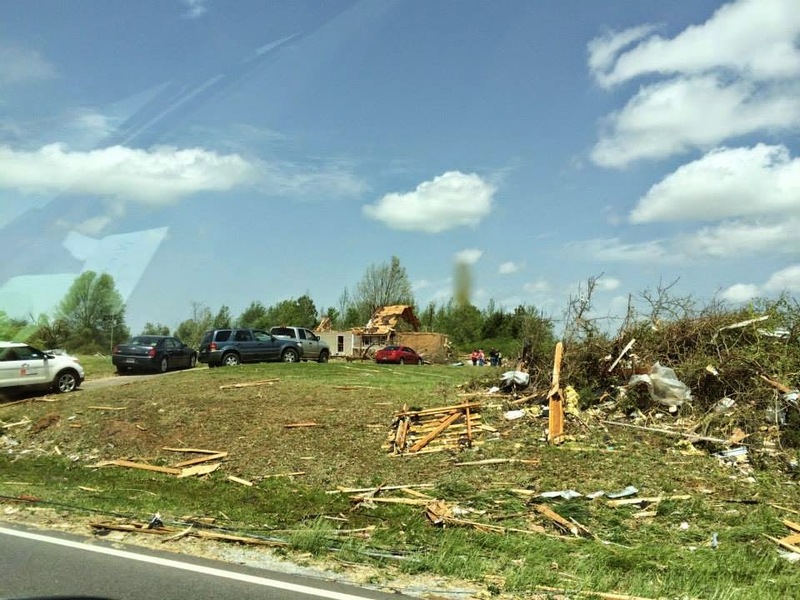 On April 28th, a tornado ripped through the county I lived in. The EF3 twister was measured at 600 yards wide with wind speeds up to 140mph. 417 homes were damaged or destroyed and two people lost their lives. The church I attended organized a volunteer effort, and since I was no longer working, I volunteered to participate in the clean up effort. What I saw that day framed my situation in a completely new light. Assisting in the clean up effort allowed me to step away from my own very minor problems to assist others with their much larger ones. Sometimes the Lord shows up in places we least expect, and he showed up for me that day. My attitude improved. My spirit was healed. I counted my blessings versus my problems. My faith grew and I knew that an opportunity would present itself. I began looking for work back in Nashville. Within a few days I received a message from a friend and former co-worker. He had seen my resume in a large stack and pulled it out. He told the hiring manager not to let me get away. I was hired three days later and have enjoyed working at the State of Tennessee since May. But that's not the end of the story. Having a house to sell in a somewhat economically depressed area is not an easy task. We listed our house in Alabama the week I lost my job in March and it finally sold in December. Having a mortgage to pay prevented my family from buying another home and we took shelter at my in-laws house. My in-laws are wonderful Christian people. They have been more than hospitable to my family and I. I'm very blessed to have people like them in my life, but let's face it...living with in-laws is not the ideal situation and with limited financial resources, we were stuck. Just as life was getting me down again, I received a phone call from my previous employer informing me that one of the guys on my team had passed. He and I were close, and we had an appreciation for each other since we had so much in common. I made the trip down to attend his funeral, and while paying my respects to his widow, the Lord showed up once again. Putting things back into perspective. A few weeks later, that lovely lady passed away after a long battle with cancer. Two wonderful people taken away far too soon. After finally selling our house in Alabama, my wife and I began looking for a place to live. We still had a bit of money to save up for a down payment, but we wanted to shop the market. 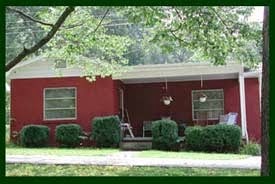 We were very fortunate to have found a property we both love and the situation was absolutely what we needed. We hope to be closing on it in early 2015. As the year winds down, and I reflect back, it would be easy to take inventory of all the bad times and heartache, but in reality, each problem is a gift. It's an opportunity to overcome something, to do something great. Without problems in our life, we would be unable to truly appreciate the good times. Every day is a day the Lord has made and we should rejoice and be glad in it. If you find yourself in a situation that isn't where you want to be, remember that sometimes it's best to bloom where you are planted. Happiness isn't always getting what you want, but wanting what you get. Never stop setting goals and making plans, but understand when those goals aren't met and those plans don't come to fruition that it just might be one of the best things to happen to you. Sometimes only time an experience can reveal what gifts problems are. Have a wonderful, happy, 2015 and may it be filled with many blessings, both those you can and those you can't see.